The 2018 Swim Season is here and the KGRC Board of Directors and pool staff are excited about a fantastic summer ahead! 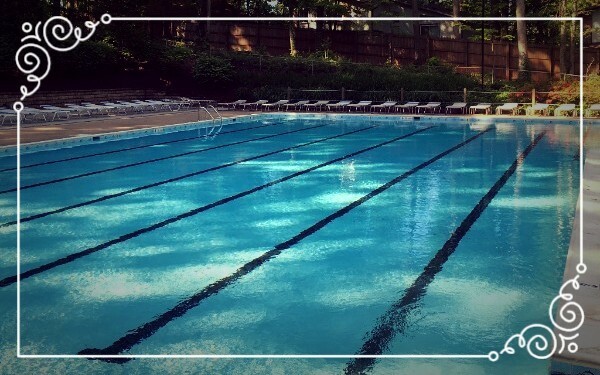 The pool opens Saturday morning at 11:30 a.m., and will stay open until 9:00 p.m. This schedule is the same Sunday and Monday/Memorial Day and all weekends throughout the summer. Until Fairfax Co. schools let out, the pool schedule is 3:30-9:00 p.m. on weekdays. When you check into the pool, be sure to have your KGRC Membership Card - every time! Anyone age 11 and older needs to have one. If you need replacement cards, please fill out the Membership Card Request Form. New members will pick up their cards at the Front Desk. Unfortunately, the weather already looks questionable for the end of the long weekend. You can keep up-to-date via text on pool closings for weather throughout the summer by signing up for RainedOut service. There will be many fun activities this weekend and throughout the summer! Our Social Committee is hard at work putting together some great activities. New this year - a teen progressive dinner! Have ideas or would like to help with any social events? Email Lauren at [email protected]. The KGRC Dolphins will start kicking it up next week! Both our amazing swim and dive teams are ready to hit the pool and practice for another successful summer season. Haven’t signed up for the teams yet? Not to worry, there is still time to join in the fun and competition. Just visit the Swim Team page and the Dive Team page for more information and schedules. The Sensory Friendly Swim Program will be offered to immediate family members with a child or children with a diagnosis which makes participating in swim during normal pool hours challenging. Stay tuned for information about the schedule for this program. Have a little one still learning to swim? Take a look at our updated Swim Lessons page to learn more about swim and dive lessons at KGRC. New this year: a roster of KGRC Dolphins’ coaches offering private and semi-private lessons will be posted on the bulletin board at the Front Desk. Questions may be directed to Holly at [email protected]. If all this activity is making you hungry, you can head over to the KGRC Snack Shack! Make sure to take advantage of Dolphin Bucks! These "refillable" prepaid cards are a great way to manage the kids' snack habit. (Or teach them to manage it!) Hint: write your name directly on your card with permanent marker. Birthday parties are always better at the pool! If you want to host a party at the pool, be sure to submit the Pool Party Reservation Request Form. You can check the calendar to see if the time is open and up to 15 guests are allowed for parties. KGRC has an amazing website! Just about every question you have can be answered there. The board also keeps you up to date on activities via our Facebook page. Check out both! Of important interest to all members are our Club By-Laws and Club Rules and Regulations Handbook. One final note, we are very proud of our staff at KGRC both in the guard shack and the snack shack. For some of our staff, this is their first job. Please take the time to give a little kindness and say thank you. Any board member and the pool manager are always available to answer questions or address concerns. Now, rub on your sunscreen and put on those suits! We'll see you at the pool!